Create a check out form for your registration to collect the important information about your registrants. Checkout forms will help you collect important information about your registrants. 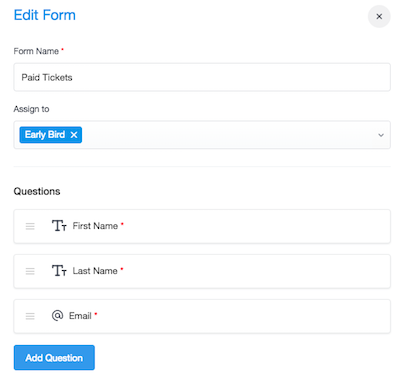 A default checkout form is automatically assigned to all your tickets, but you can create your own forms and customize them for each ticket type, or create one for all your tickets. The default form collects the email, first and last name of an attendee, but can be customized if needed. A new check out form can be created on the corresponding step of the building process or event after the Registration is published. When creating a check out form, you can change it's name (it will not be shown on the website), assign to a ticket you added and/or add other questions. Email, First Name and Last Name are added to each form by default as required fields and cannot be edited or removed. Single Textbox that will accept one line text as an answer. Multiple Choice where attendees can choose several answers from the available options pre-defined by you. Single Choice where attendees can choose only one answer from the available options pre-defined by you. 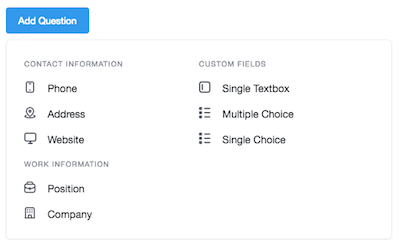 Each of the fields you add can be renamed or marked as a required field. To pre-view a checkout form you created, just click on the Preview button at the top right corner of the page and click to order a ticket you assigned the form to. Please make sure the ticket is not closed or hidden to be able to preview the form.